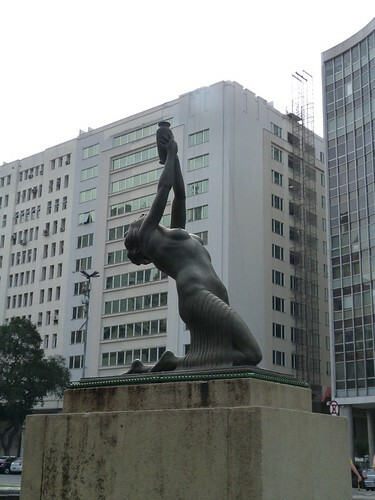 All I can tell you is that this building is close to the Praça Sete de Setembro in Belo Horizonte. 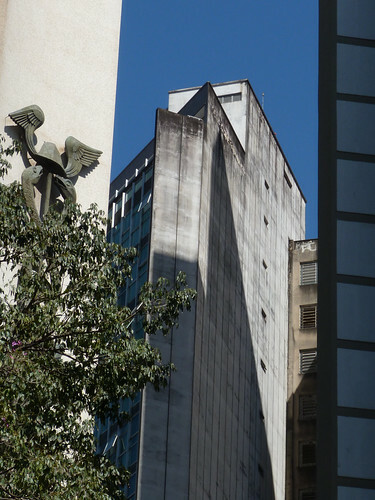 I love the combination of angles against the blue of the sky and the shadow cast by the nearby building. 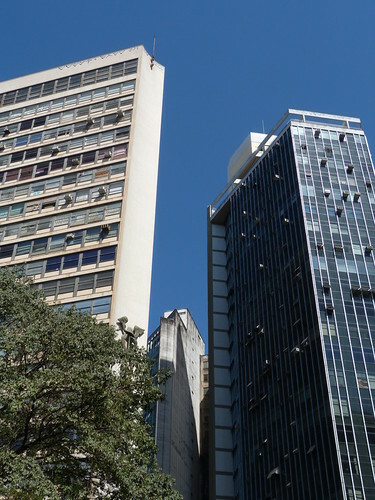 I found the buildings around the Praça Sete de Setembro in Belo Horizonte very interesting. 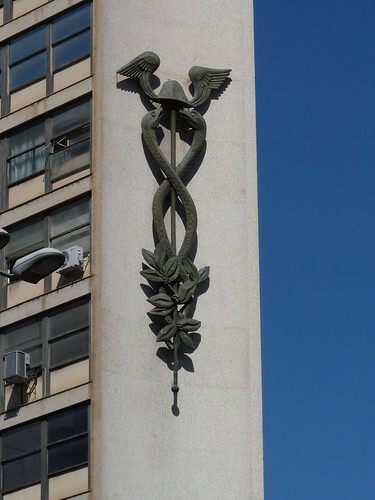 This one, for example has a huge Caduceus on the cut-off corner about half-way up. I took these photos in 2006 and it is interesting to me is that in 6 years what was clearly Sunray Flats (from the sign hanging under the stairs) has become Sunray Apartment. Singular? 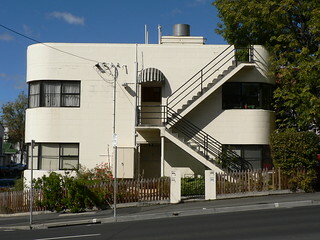 Perhaps the owners are living in the other apartment flat. 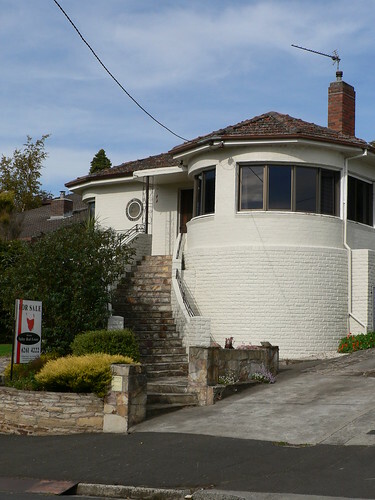 In any case it is a simple brick block of flats in Hobart with curved corners but I really do like the proportions of the steps to the second storey and roof terrace. 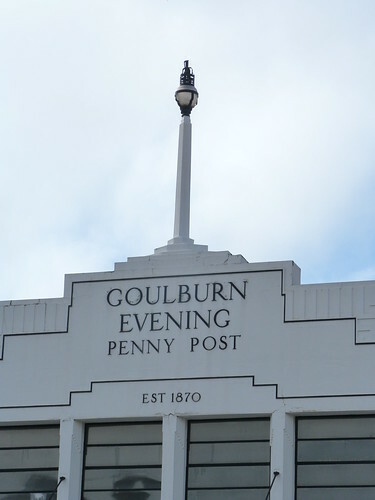 The Goulburn Evening Penny Post may have been established in 1870 but this building is probably 50 or 60 years younger than that. 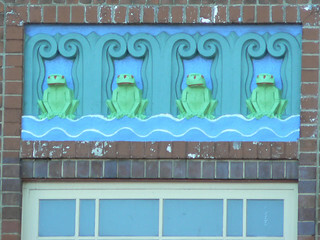 Frogs at North Sydney swimming pool. 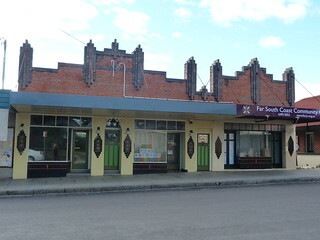 An interesting block of shops in Bega. I presume they were built at the same time yet it is clearly a pair of shops with a third 'added on'. 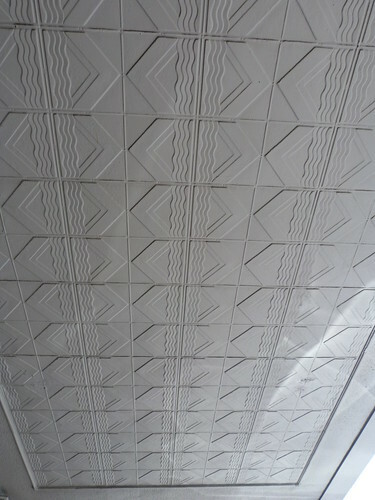 Perhaps they are older shops that were made-over in deco style or the income from the first two was needed to complete the third. 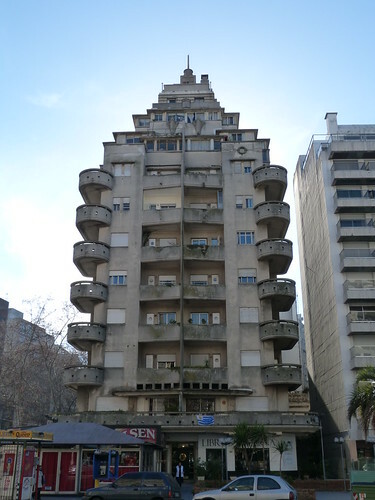 In my opinion this is one of the best Art Deco buildings in Montevideo. 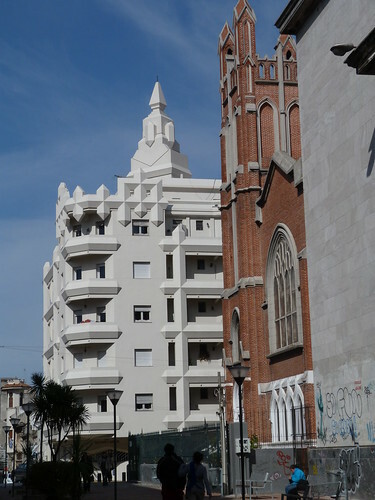 It is Edificio El Mástil located at 3105 Avenida Brasil in Pocitos. 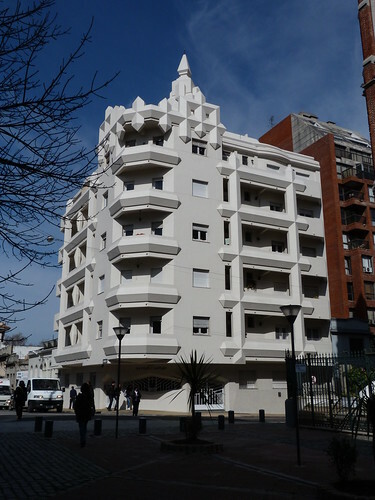 It was designed in the early 1930s by Gonzalo Vazquez Barriere and Rafael Ruano. 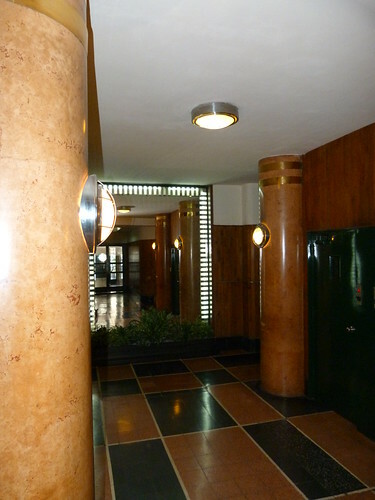 Besides being a deco building it also has a nautical theme. 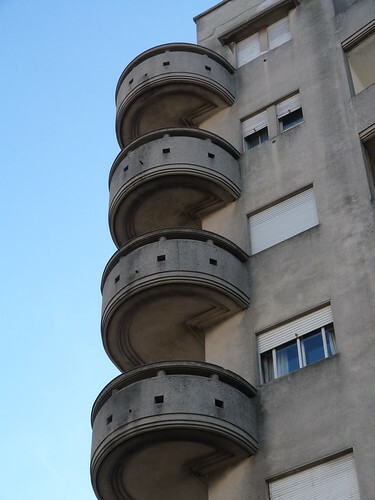 The balconies at the front could be the prow of a ship. 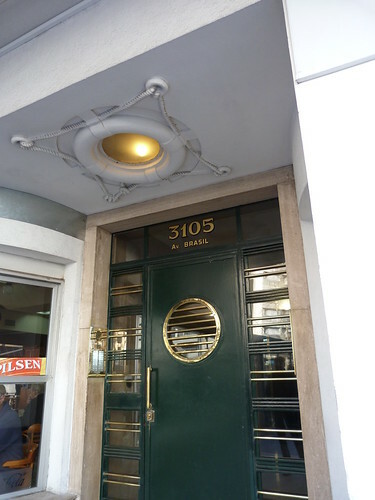 However there is no doubting the porthole in the front door and the life preserver decoration surrounding the light in the porch. 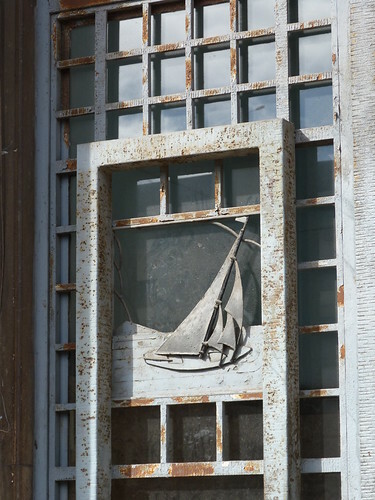 There were a pair life preservers high on the façade of the building but only one remains. 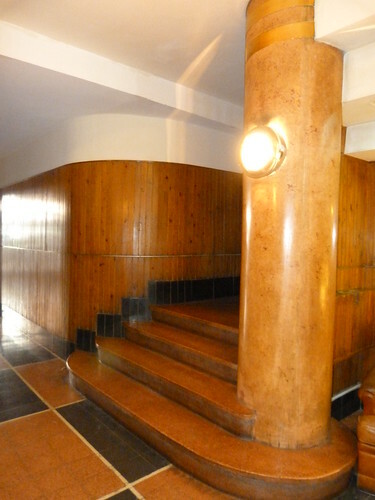 The owner saw us taking photos and invited us in prouding showing of the very well maintained foyer. 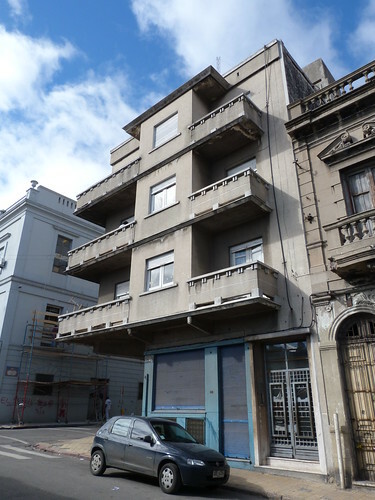 This amazing building in Montevideo looks like it was built yesterday but it actually dates from 1941 and was designed by architect & alchemist Humberto Pittamiglio (1887-1966). 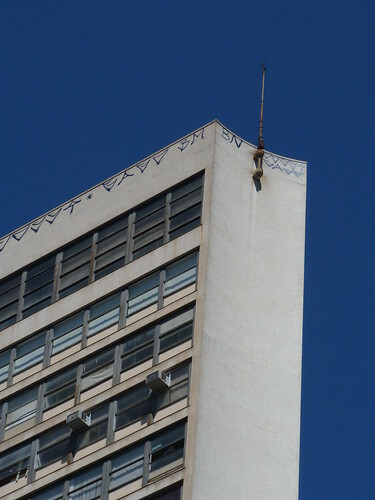 If you follow this thread on SkyScraperCity.com you'll see some older pictures of the building when it the ground floor was covered with graffiti. It looks sensational now. 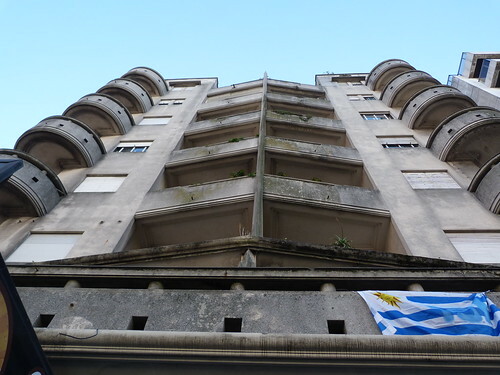 These apartments in the old city (Ciudad Vieja) of Montevideo perhaps have seen better days. 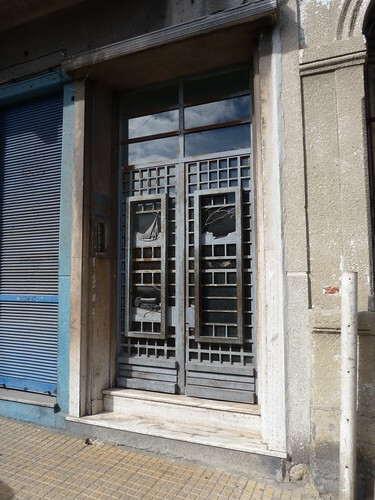 The upper floors look OK but the door tells a different story. No doubt it would have been fantastic in its day and we can see a hint of that with two of the four panels still surviving. 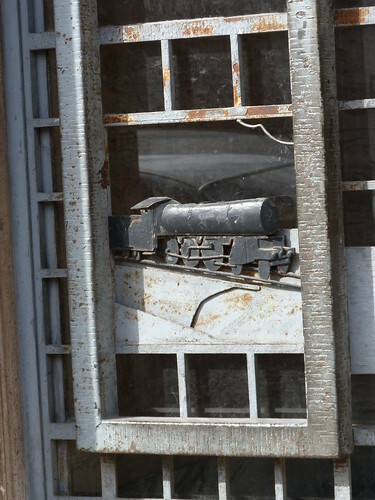 The left hand door still has its yacht and train but whatever was on the other side is gone. 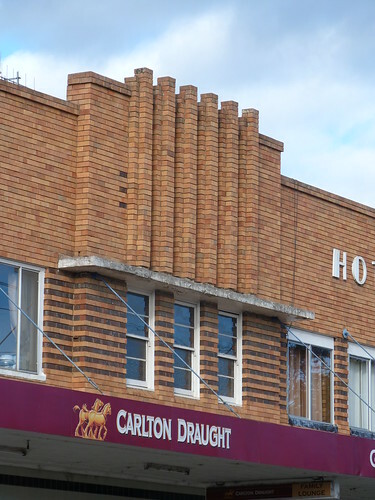 Yesterday I wrote about the former Balman Bros workshop but it was this hotel that drew me to Bega in the first place. 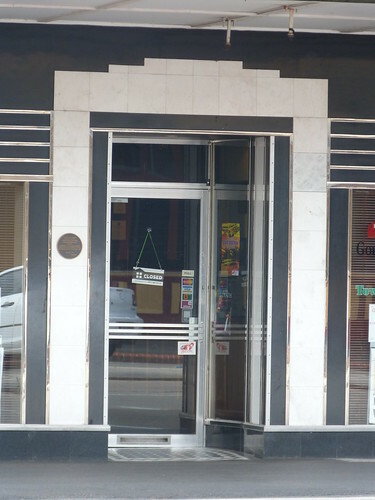 In the mid 1870s the Occidental Hotel was built at the intersection of Carp & Auckland Street but it closed in 1908 and later became the Phillip's Temperance Hotel, also known as the Bega Hostel and the Occidental Guest House. 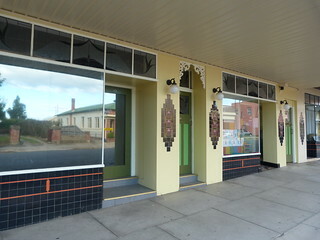 Now that's a concept, a temperance hotel. 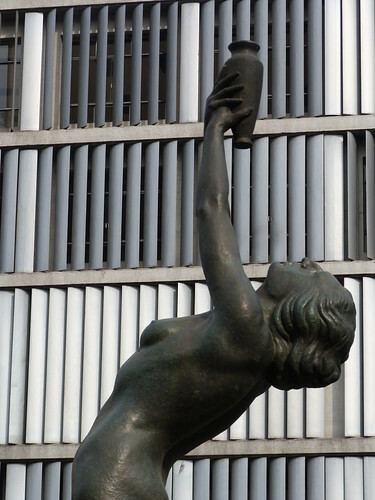 That structure was demolished in 1937 and this wonderful Art Deco pub constructed. 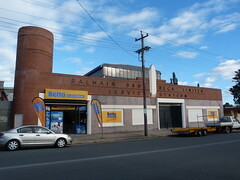 This is the former service station of Balmain Bros Bega Ltd in Bega on the south coast of New South Wales. As you can see it is now, in part, occupied by Betta Electrical. 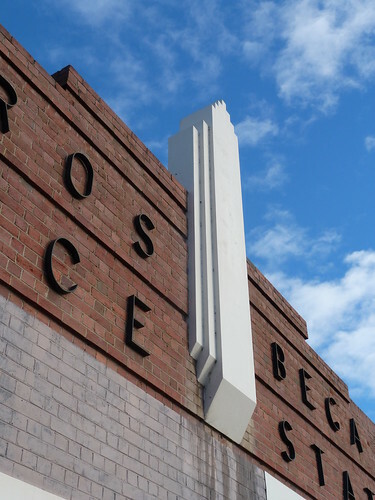 The company dates back to 1909 when brothers, Arthur & Billy Balmain establish a motor service carrying mail & passengers from Bega to Tathra and also to Cooma. 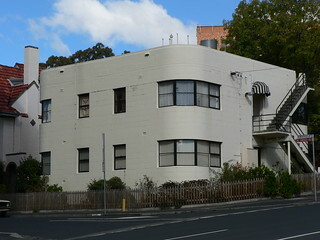 In 1935 they erected this workshop in Auckland Street, Bega with the round tower built as a masthead for the company pennant. 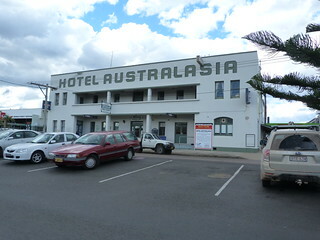 A painted plaque on the front of the Hotel Australasia in Eden says it was build in 1908 but surely it has been altered since then. 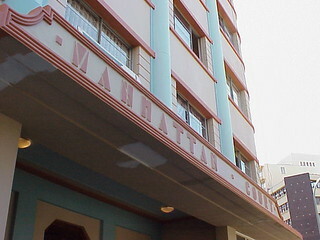 The building and the lettering look much later than that. There's another sign on the hotel, an auction sign. 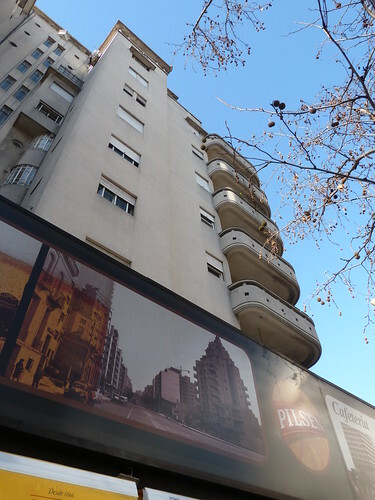 It say that the hotel is closed and it is to be sold as part of a deceased estate. 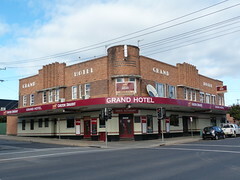 According to the Eden Magnet newspaper the hotel which closed unexpectedly on 23 May 2010, was passed in leading to much speculation about the future of the historic pub. 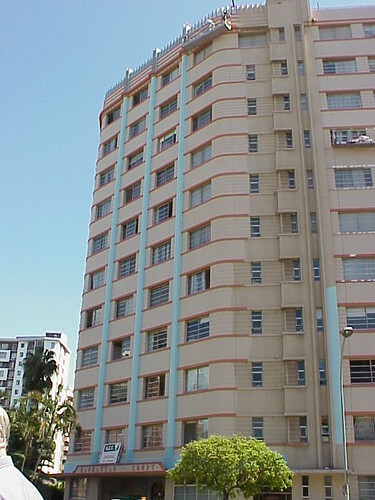 This is Manhattan Court, an apartment building in Board Street, Durban. 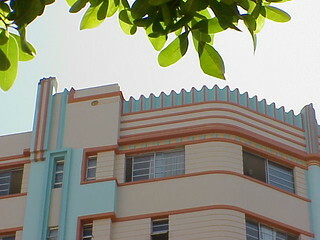 In 2003, when I took these photos, it was being painted and it looks great in these colours. 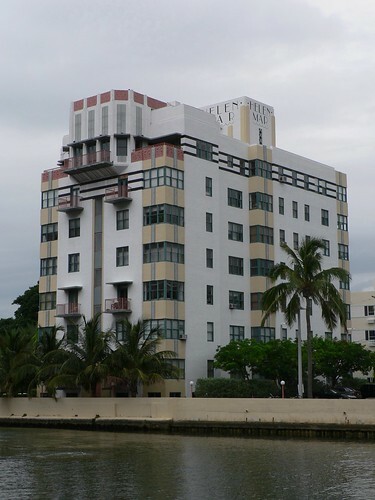 Manhattan Court was design by Frohlich and constructed around 1937. 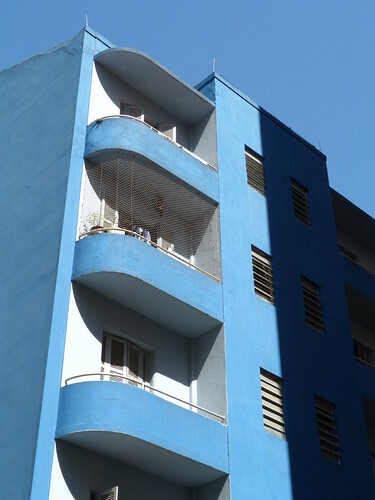 A nice block of (very blue) apartments in São Paulo. 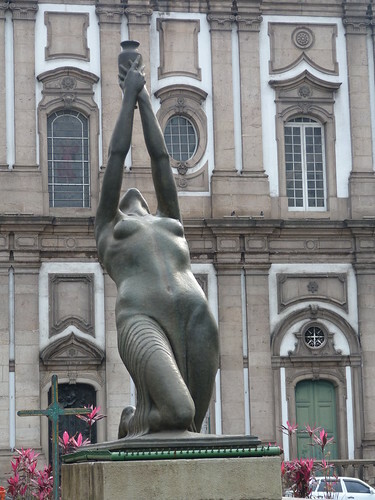 Humberto Cozzo's statue, 'Mulher com Amfora' (Woman with Amphora), in Praça Quinze de Novembro in central Rio de Janeiro dates from 1934. 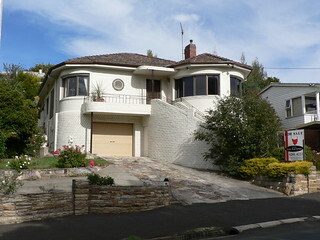 An interesting house in New Norfolk, Tasmania. 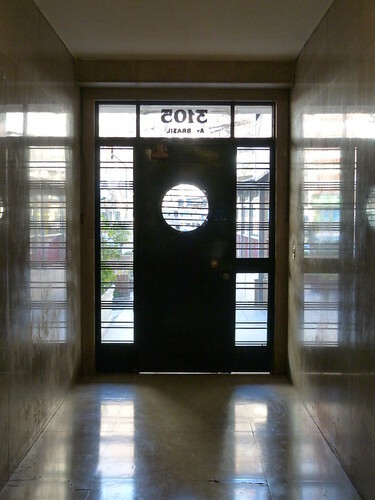 Porthole window, curved corner, rounded room on the right and lovely sweeping set of steps to the front door. Don't you love the map of Tassie on the For Sale sign. 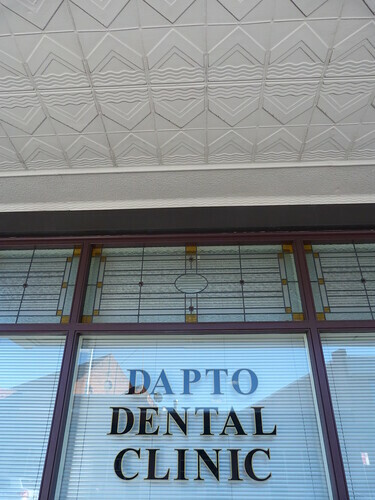 Dapto has an interesting place in Australian culture. You see, there is a greyhound track at Dapto and it is the lament of the desperate mug punter that he needs a result in the last at Dapto Dogs to recover a day's worth of losses. 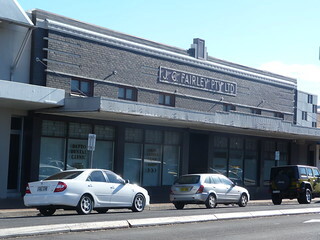 Unfortunately, I didn't see the track but I was pleased to find this nice deco building formerly occupied by J G Fairley Pty Ltd. And what a great address 1-11 Bong Bong Road. 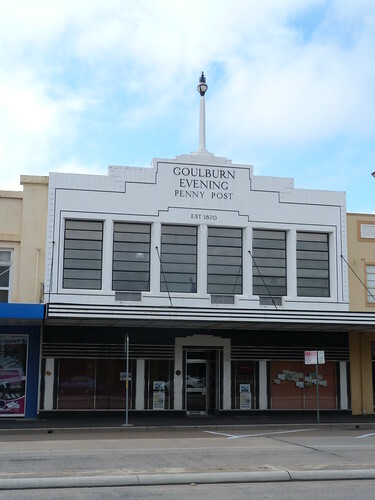 As you can see, it is a handsome symmetrical horizontal brick building with large display windows facing onto the street. 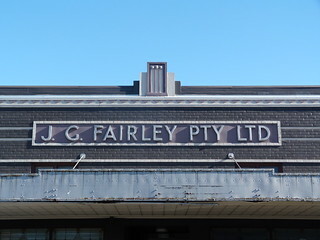 The roofline bears a stepped element above the doorway and the Fairley name is proudly displayed along the façade. 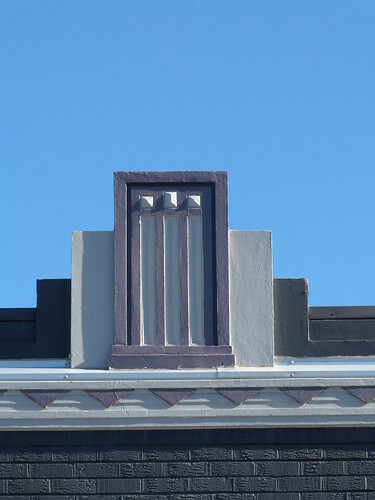 A row of smaller windows also feature a lovely deco design and a another deco pattern in the pressed tin on the underside of the verandah.